How do you live in a culture where the worldview conflicts with Christianity? Learn from Paul as he settled among the Greco-Romans of Corinth, who valued wealth and class, worship of multiple gods, and decadent pleasure seeking above all else. In this sixteenth volume of That The World May Know®, discover how to live in your own Corinth-a dechristianized Western world-in a way that glorifies God. 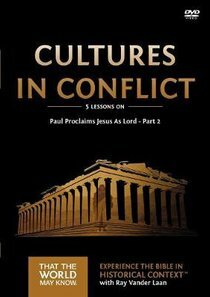 About "Cultures in Conflict : Paul Proclaims Jesus as Lord Part #02 (DVD Study) (That The World May Know Series)"